We’re your link to Facebook Marketplace. We have big news! As a Facebook Marketplace listing partner, Dealer Solutions can now link your used and demo vehicle inventory with Facebook Marketplace. 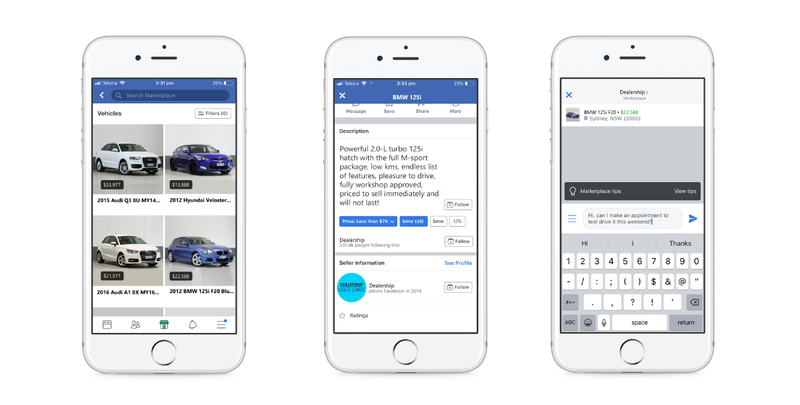 In case you missed it, Facebook announced this morning the expansion on their vehicle category in Australia allowing vehicle dealerships to list their used and demo inventory. To read Facebook’s full article, click here. So, what is Facebook Marketplace? Facebook Marketplace is a convenient destination for people to discover, buy and sell items. It offers a dedicated discovery and search experience designed to help people find their next vehicle and help local dealerships reach the millions of people who are already looking for used vehicles on Marketplace every day. According to Facebook, more than 1 in 3 people on Facebook in the US use Marketplace each month with millions of Americans looking at vehicle listings every day on this platform. We have been working closely with the team at Facebook Marketplace in recent months to ensure we can connect the inventory of our clients and any dealership in Australia with Marketplace fast and accurately, as we currently do with our 140+ other advertising destinations. Facebook Marketplace has already been highly successful in the US, with Facebook recording millions of Facebook users browsing vehicle listings on Marketplace every day! Today, we are proud to say that we are a Facebook Marketplace listing partner and look forward to getting our clients started on this advertising platform. Marketplace is a dynamic advertising destination loaded with ever-evolving features, so we are sure that more will be added to the platform to make it easier for car shoppers in Australia to find their next vehicle. Are you ready to be on Facebook Marketplace? Getting started on Marketplace is easy, and we are here to help! Once you have sent us your vehicle inventory, we’ll simply connect it to your Facebook Business Page and you will start receiving free leads. To use Facebook Marketplace, you do require a Facebook Business page. If you don’t have one, our Digital Marketing team can help you set it up and you’ll be on your way! To get started, you can submit an enquiry here and a member of our team will be in touch soon. Alternatively, you can learn more about Facebook Marketplace here.